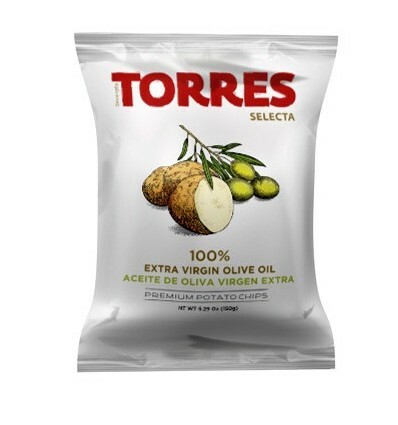 Buy Olive Oil Potato Chips - Torres 50 gr. > Comestibles>100% Extra Virgin Olive Oil Potato Chips - Selecta by Torres 50 gr. 100% Extra Virgin Olive Oil Potato Chips - Selecta by Torres 50 gr. Olive Oil Selecta Potato Chips by Torres 40 grams format, transports us to the authentic fried potato in virgin pure olive oil. With a great oil taste and perfect frying, these potatoes are a standard in the world of potato chips. Potato chips that could be called gourmet potatoes.